It often falls on my shoulders to blog about an alternative snack to crisps and nuts. Don't get me wrong, I love crisps but probably eat far too many packets for my own good. So every now and then I like to find a healthier option. One that doesn't effect my waist so much, especially if I'm sat infront of a film for a couple of hours and eat more than one packet with a high calorie larger than usual beer or two! 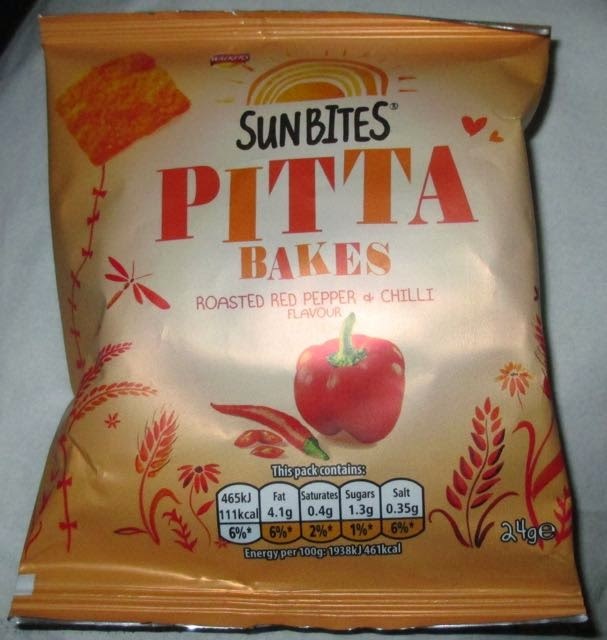 These Walkers Sunbites Pitta Bakes Roasted Pepper and Chilli Flavour certainly seem to fit the bill. I love peppers and I also love chillis, so putting them in a packet with some healthy bread sounds like a good idea to me. It almost feels like not needing to go to the gym! 24g packet with 111 calories, 4.1g of fat, 1.3g of sugar and 0.35g of salt. The ingredients included; multigrains (52%); (wheatflour; (contains; calcium, iron, thiamin, and niacin) wholemeal wheatflour, oat flour, wholemeal barley flour, and maize flour), yeast, salt, sunflower oil (contains antioxidant, Rosemary extract), Roasted Pepper and Chilli Seasoning contains; salt, sugar, natural flavourings (with milk), onion powder, paprika, tomato powder, citric acid, black pepper, garlic powder, red bell pepper powder, cayenne pepper powder, and colour paprika extract. Allergy advice contains; wheat, oat, barley, milk and was prepared in a factory that handles gluten, soya and mustard. I had a packet of the cheese ones today and they were bloody lovely! It's not often you get a healthier product that's actually just as nice as a full fat product. I would happily munch these all day long.